A secret distillery is not so secret any more following the launch of a new visitor experience in the heart of a Highland community. Speyside Distillery has made a six-figure investment into a craft spirit, art, tastings and distribution venue in Aviemore – Speyside Distillery, The Snug. The Snug aims to bring alive the distillery’s history by sharing its heritage and the art of the distilling process behind its range of whisky and gin. The distillery has gained a reputation as a hidden gem because of its remote location and although The Snug will give it a high-profile presence, the distillery will still provide very limited visitor access by arrangement. The Snug, based at the Aviemore Retail Park, will create at least two full-time and four part-time jobs. Operators Speyside Distillers has invested £200,000 into the project, with £90,767 being contributed by Highlands and Islands Enterprise to support the creation of the venture and employment of staff. The official opening ceremony took place last night (Thursday, 7 June 2018) and was performed by Drew Hendry, MP for Inverness, Nairn, Badenoch and Strathspey, who cut a ribbon on the new premises. Set in the foothills of the Cairgorms, the picturesque distillery is also used as a base for artist in residence, Joanna McDonough. 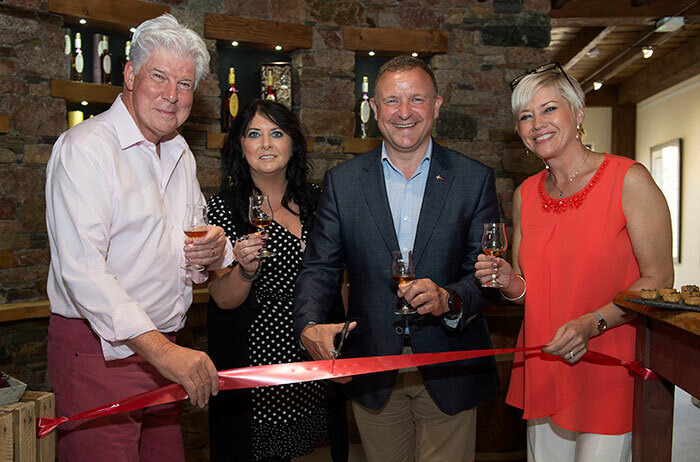 Speyside Distillers chief executive officer John Harvey McDonough said it was always a dream for the company to find a way of sharing the history of the distillery’s heritage to passionate fans from all over the world. He said: “We describe Speyside Distillery as the secret distillery because it’s hidden from the public, but all that is going to change now. The Snug will allow us to have a presence in Aviemore, and the distillery itself will continue to welcome a very limited number of people in pre-organised visits. “Whisky has been in my family for centuries and my late grandfather, Alec Harvey, conducted his whisky trading business from Seaham Hall in Sunderland where he used to frequent a local pub, with a busy bar named The Snug. Managing director Patricia Dillon said The Snug was an important platform for the continued growth of the brands in the Speyside Distillers portfolio both in the UK and international markets. The firm, which was recently honoured with a Department of International Trade Board of Trade Award for export achievements – one of only six Scottish companies and the first whisky firm to achieve the award - is now present in 34 international markets. “The Snug will be a first-class facility for our team and global brand ambassadors, customers and VIP guests; a place where they can further establish their knowledge and understanding of Speyside Distillery, its craft spirits and art,” she said. Highlands and Islands Enterprise account manager David Taylor said the organisation was pleased to be able to support the initiative. He said: “Speyside Distillery is recognised as one of the best exporting companies in Scotland.